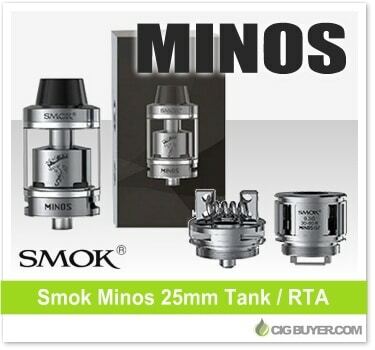 The Smok Minos Tank is a flexible 25mm sub-ohm tank system that incorporates Smoktech’s new Q2 pre-built cores, as well as a 2-post (velocity-style) M2 build deck for DIY’ers. Referred to as the “Vaping Taste King”, it’s designed specifically to produce superb flavor and features two large bottom adjustable airflow slots to generate plenty of vapor. It holds 4ml of juice, has a removable top cap fill system and comes with a unique 510 drip tip with a V-shape airflow channel to improve it’s overall performance.